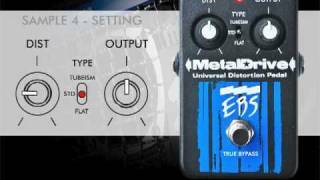 EBS MetalDrive deliver high-gain distortion for use in modern metal music, and other music styles that call for a mean distorted sound. The Black Label Pedals provide great tone for guitar, keyboard and other instruments as well. Smooth working effects with very little or no noise and a fat tone that keep the bottom solid.